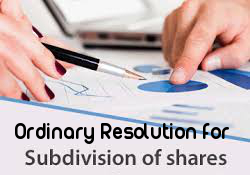 RESOLVED THAT pursuant to Section 61(1)(d) and other applicable provisions, if any, of the Companies Act, 2013 and Article... of Articles of Association of the company, all the __________ (No of Shares) equity shares of Rs. 100 (Rupees hundred) each of the company be and are hereby sub-divided into __________ (No of Shares) equity shares of Rs. 10/- (Rupees ten) each. RESOLVED FURTHER THAT all the present shareholders holding in all __________ (No of Shares) issued, subscribed and fully paid equity shares of Rs. 100 (Rupees hundred) each be issued, in lieu of their present shareholding, the number of fully paid consolidated equity shares of Rs. 10 (Rupees ten) each of the aggregate value equal to the amount paid by each shareholder on his/her existing fully paid equity shares of Rs. 100/- (Rupees hundred) each. RESOLVED FURTHER THAT the Board of directors of the company be and is hereby authorised to take all the necessary steps for giving effect the foregoing resolution, including recall of the existing share certificates, issue of new share certificates in lieu of the existing issued share certificates in terms of the foregoing resolutions and in accordance with the applicable provisions of the Companies Act, 2013.